We can replace old worn-out roofs or provide roofing installations for new homes or new commercial buildings. ​Our experience team can repair all roofs, any issue is an easy fix with our decades of experience in roofing. Make your roof look like new again with Brisbane's re roofing specialists. ​New metal roof installations and guttering repairs done by a professional roofing business, with our teams of experienced tradesmen. Does your roof need replacing? - Old, worn and unsightly - Make a quote request for a new roof and we will be happy to help today. Are you considering roof restoration? - Cost effective while remaining professional? - Ask an expert and call us today! Choose our team of roofing experts in Brisbane! - We take pride in ALL OUR work. Our roofing contractors will get your roof replacement done quickly and at the most affordable price. As one of the most trusted roof replacement companies in Brisbane with years of experience, a team of expert professionals and roofing specialists who can identify the cause of roof issues, Roofers Brisbane will never let you down. We use only the highest quality materials and components in all of our roofing work. We are Brisbane's roofing specialists with the highest quality roofing solutions, fantastic service and unbeatable value for money. ​We provide the perfect all-in-one roofing service and have earned a reputation forquality, customer service, and dedication, so call us today or request a quote to see what Roofers Brisbane has to offer. We have experience on all types of roofing. Whatever your requirements we are here to help. Trust your local Roofing company to provide you with great service alongside quality workmanship at great rates. New roofs installed by experienced tradesman. We have been installing new roofs for decades. Quality workmanship and dedication to detail sets us apart from the rest. Roofing Inspector’s Recommendation: The first step is to get proper inspection of the roof. Get the current condition assessed by a roofing expert and take his opinion as per what will be the best option under the current circumstances. His recommendations can help you decide the best option depending on your current situation. Age of the roof: The Age of the roof is an important factor when deciding between a repair or a roof replacement. If your roof is comparatively young, you might just need regular maintenance to keep it in good condition for many more years to come. This implies to keep the gutters free of debris, prevent leaks around flashing's, replace the damaged tiles, etc. But if your roof is relatively old, it could mean replacing your roof is the best option. Cost Involved: You will have to assess the cost involved in both the cases. If your roofer estimated the repairs to be major and costing $7000 and you can get the entire roof replaced for $12000, Repairing may not be the best option as the maintenance of the old roof can increase due to the age and life expectancy. But if the repairs are minor costing a lesser amount involving very less amount, then having it repaired would be a better option in comparison to the roof replacement. Types of roofing problems: The types of problems you can have with your roof can also help you decide whether to go for a roof repair or roof replacement. If your roof has numerous leaks, or has missed some cracked tiles or is deteriorating, this is certainly not a good indication. Ask our experts for an assessment of your current roof so we can give you the right information to make the best decision. 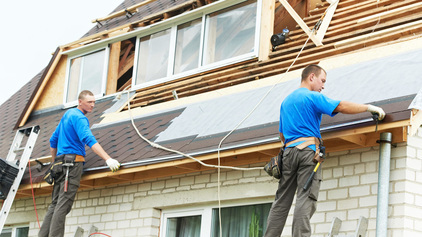 ​Why choose Roofers Brisbane as your roofing specialists? We are among the leading roofing specialists Brisbane offering premium roofing services. We are fully qualified and experienced roofing company in Brisbane with exceptional expertise. Whether you want to repair or replace your roof, we have the best team of expert professionals to get the job done right. We are known for our reliability and competitive pricing. Our experts have extensive knowledge of various roofing requirements and styles of old and modern roofing in Brisbane. We offer warranty to our workmanship and make sure that we make use of the best of the available roofing materials. The roofing materials that we select for our roofing projects last for decades. We make use of the most innovative technologies in our work and are very much confident of the quality we deliver. We are the one of Brisbane's most trusted and reliable roofing companies in Brisbane bringing you the best quality products and services at competitive prices. Our mission is to provide quality workmanship and professional friendly service to all our clients. We know that your roof is a major asset and adds significantly to the value and safety of your home. That's why we take pride in every job to ensure you get the best using the finest materials. We look forward to helping you with your roofing needs.